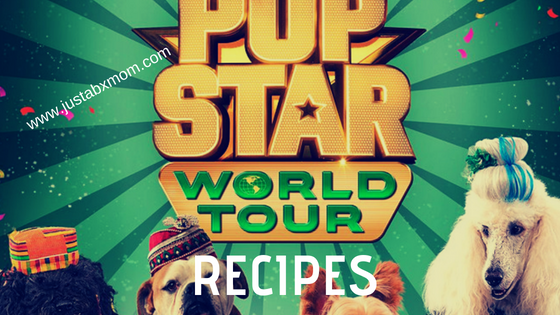 We were really excited to be included in the “PUP STAR: WORLD TOUR” Cuisine Contest. I mean did you see the remarkably cool suitcase that introduced the contest to us? And as I’m sure you know by now the movie is so much fun we really wanted to participate. Sadly, this mama got way too much going on to do anything that has deadlines! We didn’t get to participate in the contest but don’t boo hoo for us. We might not be winning the grand prize (which was really freaking awesome) but we do get to share some really tasty recipes with all of you. And once this mama catches up with her life I will be shopping for the ingredients to make ALL of these yummy dishes. Keep reading to travel on a culinary journey around the globe. Beat egg white and water in a small bowl; set aside. Cream the butter and sugar in a large bowl until light and fluffy – beat in egg and almond extract. Combine flour, baking soda and salt in a separate bowl. Add to creamed mixture and beat until thoroughly combined. Take a tablespoon of dough and roll it into a ball. Place 2 inches apart on ungreased baking sheets. Gently flatten with the bottom of a drinking glass. Sprinkle each cookie with almond slices, gently pressing almonds into the dough. Gently brush egg white mixture over cookies. Bake 14 – 16 minutes or until edges and bottoms are lightly browned. Let sit for 2 minutes before placing on wire racks to cool. In a medium bowl mix together the coconut, sugar and egg yolks to form stiff dough. Shape into 1 inch balls and roll each ball in flour to coat. Place on a baking sheet, spacing about 2 inches apart. 3. Bake for 35-40 minutes, or until fork tender. 5. When corn is done brush with garlic mayo. Roll in cotija cheese. Combine warm water, sugar, and yeast in a large bowl. Let stand for 5 minutes until foamy. Add salt and flour and mix thoroughly. Knead dough on a floured workspace about 20 times and form into a tight ball. Put dough in a well-oiled bowl and cover with a damp towel. Place bowl of covered dough in a warm place to rise for 30-45 minutes. Dough won’t rise much but doesn’t need to. Turn dough out onto a floured workspace and divide dough into 8 pieces and roll out with a rolling pin about 1/8″ thick. Grill dough pieces on a grill or electric griddle. In a pinch, a frying pan with some nonstick cooking spray will work. Grill for 1-2 minutes on each side. I love how simple the recipes are. They are easy to follow and only have a few ingredients. They are the perfect recipes to introduce your littles to the kitchen and are a perfect way to have some family fun. Once you have created your culinary delights sit down and enjoy the Pup Star movie on Netflix! In case you haven’t already seen the movie here is the trailer.